The ethanol extraction method was utilized to extract the oil from camellia seed oil. Single-factor tests were applied to study the effects of ethanol concentration, material/solvent ratio and extraction temperature on the yield of camellia seed oil. Then, response surface methodology (RSM) was conducted to ascertain the optimum condition for oil extraction, and the fatty acid composition of the oil were analyzed. Results indicated that the optimal parameters of extraction were using ethanol concentration 100%, material/solvent ratio 1:12 and extraction temperature 90 ℃. Under these conditions, the extraction yield was high up 45.36%（v/w）.According to the results of GC-MS analysis, the camellia seed oil was composed of eight kinds of fatty acids. The content of 10-Octadecenoic acid was 77.57%. Calculating via the area normalization method, the unsaturated fatty acid accounted for 88.01% (w/w) of the total amount of oil. Therefore, the camellia seed oil was a kind of nutritional oil with a high development potential. The genus Camellia, native to East Asia, belongs to the Theaceae family and comprise ca.100 large evergreen shrub species world-wide. They are economically important for human consumption (eg., Camellia sinensis), oil production (eg., C. oleifera), cosmetics (eg., C.japonica, C. reticulate, and as ornamental plants (eg., C. japonica, C. reticulate, and C.sasanqua). In China, the seeds of C. oleifera can be pressed to obtain high quality oils (camellia seed oils) that are used extensively for cooking. The fatty acid (FA) composition of edible oil contains abundant unsaturated fatty acids (UFA) . The UFA content in the oil can reach as much as 90%, which may be highest amount so far reported in edible oils. Moreover, its monounsaturated FA content is greater than that of olive oil, which is UFA complies completely with the international nutritional standards of “omega meals”. [2-6] Camellia oil is often the target of adulteration or mislabeling because it is an expensive product with unique flavor and taste, good storage stability and high nutritional and medicinal values. In China, oil extraction technologies that have been extensively studied and applied mainly include: physical pressing method , organic solvent dissolution method , supercritical CO2 extraction method [9-10], water generation method  and water enzymatic method . Physical compression results in high levels of grease impurities, high acid and peroxide values, and is not easy to store. The use of solvent No. 6 to extract oil and oil increases the oil production rate, but solvent evaporation and environmental pollution as well as solvent residue remain an insurmountable problem[13-14]. As an extraction solvent, ethanol had a wide application prospect because it was recyclable and belongs to a non-toxic, green and environmentally friendly environment. In response to these problems, the ethanol was used as an extraction solvent to extract camellia seed oil and optimize the extraction process to provide basic data support for the development of the camellia seed oil industry. Camellia seeds（C. oleifera A.）were obtained from the Hubei Suizhou Yunwu Mountain Tea Farm. These samples were stored at ambient condition in air tight plastic containers until used. These seeds were sieved using 60 mesh sieves (250mm). The seeds free of foreign matter were then used directly for oil extraction after grinding into fine powder. The moisture content of camellia seeds was 2.91% by dry method. And the fat content was 49.5% by Soxhlet extraction method. (1) Effect of ethanol concentration on extraction rate. Weigh 60g of camellia seed in 1000mL conical flask, add ethanol solution with concentration of 50%, 60%, 70%, 80%, 90%, 100% according to the ratio of material to liquid 1:6. Then, condensing and refluxing for 2 h under the conditions of the extraction temperature of 75 °C, the mixture was filtered, and the supernatant was collected, then concentrated by rotary evaporation, and the obtained oil was collected. (2) Effect of materials/liquid ratio on extraction rate. Weigh 60g of camellia seed in 1000mL conical flask, add ethanol solution with materials/liquid ratio of 1:4, 1:6, 1:8, 1:10, 1:12, 1:14 (m/v) according to the ethanol concentrations 95% . Then, condensing and refluxing for 2 h under the conditions of the extraction temperature of 75 °C, the mixture was filtered, and the supernatant was collected, then concentrated by rotary evaporation, and the obtained oil was collected. (3) Effect of extraction temperature on extraction rate. Weigh 60g of camellia seed in a 1000mL Erlenmeyer flask, add 95% ethanol solution according to the material/ liquid ratio 1:10, and condense and reflux for 2h at 55 °C, 65 °C, 75 °C, 85 °C, 95 °C, the mixture was filtered, and the supernatant was collected, then concentrated by rotary evaporation, and the obtained oil was collected. On the basis of the single-factor experimental results, the response surface experiment was used to optimize the ethanol extraction of camellia seed oil. The ethanol concentration(X1), materials/liquid ratio(X2) and temperature(X3) were selected as the influencing factors, and the oil extraction rate was the experimental index. The response surface experimental design results are shown in Table 1. Fatty acids of oils were saponified and methyl-esterified, based on the MIDI protocols. The GC-MS analysis for the fatty acid methyl esters(FAMEs)（1μL）was conducted using an QP2010 plus gas chromatograph (Shimadzu technologies) equipped with a capillary column, HP-88, with dimensions of 100 m×0.25 mm×0.25μm film thickness (Shimadzu technologies). The capillary column temperature was programmed from 150 to 250℃ by starting from 150℃ for 2min,increasing at a rate of 2℃ min-1, and the holding and at 250℃ for 10min.Helium was the carrier gas with a flow rate of 35.6 mL min-1.The mass spectrometer was operated in the electron impact mode. The FAME profile was identified by comparing with the database, National Institute of Standard Technology (NJST) Library. The individual fatty acid composition was expressed as percentages of total fatty acids . All the experiments were performed in triplicate, and statistical significance was calculated by one-way analysis of variance (ANOVA). A value of p≤0.05 indicated statistical significance, using Least-Significant Difference tests. Figure 1 shows the effect of different ethanol concentrations on the extraction rate of Camellia seed oil. From the figure, the extraction rate of Camellia seeds oil decreases with increasing ethanol concentration in a certain ethanol concentration range. When the ethanol concentration exceeds 90%. The extraction rate shows a sudden increase. TANG Zuojiao et al. used ethanol to extract oil from the camellia cake. The experimental results of ethanol concentration of 60% to 95% were increasing, which is quite different from the study. Li Min et al. used ethanol to extract tea saponin from Camellia cake. It was found that the extraction rate of tea saponin increased first and then decreased in the range of 60% to 95% ethanol concentration. The reason for the decrease in this study was that the increase was caused by ethanol. The concentration is less than 90%, and certain tea saponin is also dissolved with the oil, which is consistent with the test phenomenon. The low-concentration ethanol extracts the oil to appear dark red, and the ethanol extract with a concentration of more than 90% is pale yellow. As can be seen from Figure 2, the higher the ethanol concentration, the yellower the oil color, the lower the oil tea saponin content, and the purer the oil. This figure can visually verify the above analysis results. 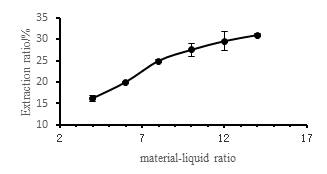 Figure 3 shows the effect of different ratios of material to liquid on the extraction rate of camellia seed oil. From the figure, as the ratio of material to liquid increases, the extraction rate of camellia seed oil increases continuously. The larger the ratio of material to liquid, the higher the extraction rate. When the liquid ratio exceeds 1:10, the extraction rate increases slowly with the ratio of material to liquid. As the ratio of liquid to liquid increases, the amount of ethanol used increases, and the contact between oil and ethanol is more. The movement between them is more intense and the oil is more likely to spread. However, the amount of camellia seed is certain. Once the saturation state is reached, the amount of oil extracted also reaches a certain level, and the extraction rate tends to be stable. In order to reduce the amount of ethanol and reduce the production cost, it is suitable to select a ratio of material to liquid of 1:10. Figure 4 shows the effect of different extraction temperatures on the extraction rate of Camellia seed oil. From the figure, the extraction rate of Camellia seed oil increases with the increase of extraction temperature. The higher the temperature, the higher the extraction rate, the higher the temperature will accelerate the oil. The movement of particles and ethanol molecules makes the dissolved fat more, and the boiling point of ethanol is 78.3 ° C. Above this temperature, the ethanol will boil, which is more conducive to the movement of the oil and better to dissolve with ethanol. However, the higher the temperature, the faster the ethanol volatilizes, and the oil may not be completely dissolved. Therefore, the extraction rate is not well controlled at 95 ° C. Considering various conditions, 85 ° C is selected as the optimum temperature. According to the single factor test results and the central combination experimental design principle of Box-Behnken experimental design, the material-to-liquid ratio (X1), extraction temperature (X2) and ethanol concentration (X3) were selected as the influencing factors, and the oil extraction rate (Y) was the experiment. The results of the response surface experimental design are shown in Table 2. Note: p < 0.01, which is extremely significant, indicated by **; p < 0.05, significant, indicated by *; p > 0.05, is not significant. The equation R2 = 0.9914, which fully demonstrates the high degree of fit of the model over the boundaries of the experimental range. Equation analysis and significance test were performed on the regression equation. The results are shown in Table 3. It can be seen from Table 3 that the secondary term of ethanol concentration (X1), solid-liquid ratio (X2), temperature (X3), and ethanol concentration (X1) have a significant effect on the oil extraction rate (P<0.01). The interaction of the factors is not significant. To maximize the R value, the optimal solution is obtained for the above equation (1), X1=1.00, X2=1.00, X3=1.00, that is, the ethanol concentration is 100%, the ratio of material to liquid is 1:12, and the extraction temperature is 90 °C. The maximum extraction rate(Y) is 45.92%. The test was repeated three times for the above parameters and the average value Y is 45.36%. Camellia seed oil was subjected to methylation treatment and analyzed by GC-MS. The ion chromatogram of the gas chromatograph is shown in Fig. 5. After analysis by computer chemistry workstation, the fatty acids are detected. The area normalization method is used to calculate the relative fatty acids in the oil. Percentage, the results are shown in Table 5. Table 5 shows the fatty acid composition and relative percentage of camellia seed oil. From the table, the fatty acids in camellia seed oil mainly include octadecenoic acid, hexadecadienoic acid and palmitic acid, and unsaturated fatty acids account for 88.01%. Among them, octadecenoic acid accounted for 77.57%. It can be seen that camellia seed oil is a kind of oil mainly composed of unsaturated fatty acids. This characteristic is significantly different from other vegetable oils and fats. Currently, polyunsaturated fatty acids. The development has become one of the hotspots of functional food research, so camellia seed oil is a nutrient oil with high development potential. Ethanol was used for the extraction of oils such as soybean oil , rice bran oil  and sunflower oil , and ethanol was safe, non-toxic and recyclable. Therefore, this study used ethanol to extract camellia seed oil. The results of single factor analysis showed that the low concentration of ethanol was accompanied by the spillage of tea saponin in the process of oil extraction, which affected the quality of oil. The higher the temperature, the more beneficial to increase the solubility of ethanol to oil; the larger the ratio of material to liquid, the oil extraction The higher the rate, the more the ratio of material to liquid increases, the extraction efficiency gradually stabilizes. Extracting camellia seed oil with ethanol, optimize the process conditions by response surface experiment design, and obtain the optimal process conditions: ethanol concentration 100%, material-liquid ratio 1:12%, extraction temperature 90 °C, mountain tea under this condition. The extraction rate of seed oil was 45.36%. The response surface mathematical model obtained in this experiment can predict the extraction rate of oil in Camellia seed oil. The fatty acid in the oil was detected by GC-MS gas chromatography-mass spectrometry. The octadecenoic acid in camellia seed oil is the main fatty acid component, and the unsaturated fatty acid in the oil is 88.01%. Unsaturated fatty acid-based oils have very high development value. This work was supported by the Central Public-interest Scientific Institution Basal Research Fund for Chinese Academy of Tropical Agricultural Sciences (No.1630122017014). WALL M M. Functional lipid characteristics, oxidative stability, and antioxidant activity of macadamia nut (Macadamia integrifolia) cultivars [J]. Food Chemistry, 2010, 121(4):1103-1108. Zhou X, Jiang S, Zhao D. et al. Changes in physicochemical properties and protein structure of surimi enhanced with camellia tea oil [J]. Lwt, 2017, 84:562-571. Su H, Wang S., RONG R F. Role of functional lipids in conjugated linoleic acid a review [J]. Chinese Journal of Bioprocess Engineering, 2016, 14(06):77-81. Xu X F, YAN H, ZHANG Y, Research progress on extraction and activity of the three main components of camellia oleifera seeds [J]. Packaging and Food Machinery, 2018, 36(04):44-48. Wang Z Y, NIE W, HE Y C et al. Advances in extraction technology and active constituents of camellia oleifera seed oil [J]. South china Forestry science, 2018, 46(05):20-23. Yang J Y, CHEN F, SONG L W et al. Research progress on extraction technology of camellia oil [J]. Food & Machinery, 2016, 32(02):183-187. Lv Q. Study on the extraction of tea seed oil and tea saponin by n-hexane-water-ethanol two-liquid phase system [D]. Jiangxi University of Science and Technology, 2017. Zhang Q Y. Kinetic study and extracted red pepper seed oil by supercritical carbon dioxide [D], Northwest University, 2016. LIN C Y, FAN C L. Fuel properties of biodiesel produced from Camellia oleifera Abel oil through supercritical-methanol Tran's esterification [J]. Fuel, 2011, 90(6):2240-2244. Zhong J Z, Dun R Y, Hu X T et al. Extraction of cashew nuts oil and its physicochemical properties [J]. Journal of the Chinese Cereals and Oils Association, 2016, 31(01):31-35. DU Y S, ZHANG L F. Preliminary study on aqueous enzymatic extraction process for oil extraction [J]. Cereals & Oils, 2005, (06):10-12. YANG J W. Green processing technology of camellia seeds [J]. XIANDAISHIPIN, 2018, (18):146-147. Ge H L, PENG L, MENG X H et al. Comparison into quality of camellia oil extracted by different methods[J]. Acta Agricultural Zhejianggensis, 2017, 29(07):1195-1200. Tang Z J, LI Y, DONG X R et al. Study on extraction of Residual oil in defatted cake of camellia using ethanol as solvent [J]. Chemistry & Bioengineering, 2012, 29(05):60-63. Li M, Wang C M. Study on extraction of tea saponin from camellia cake [J]. Journal of Chinese Cereals and Oils Association, 2011, 26(05):38-41. Mirian M S, Larissa L V, Tatiane A T et al. Effects of different alcoholic extraction conditions on soybean oil yield, fatty acid composition and protein solubility of defatted meal [J]. Food Research International, 2014, (62):662-670. Ramon O, Vinicius O, Keila K A et al. Effects of the extraction conditions on the yield and composition of rice bran oil extracted with ethanol-A response surface approach [J]. Food and Bio products Processing, 2012, (90):22-31. Erica R, Maria E, Amalia A et al. Extraction of sunflower oil using ethanol as solvent [J]. Journal of Food Engineering, 2016, (178):190-197.